Here is some information that will provide you with the questions you need in order to ensure that you are receiving the correct treatment for your condition. 1. The term “stem cell” conjures up a lot of different images for different people. For the topic of this conversation, I am referring to the adult mesenchymal stem cell, or the cell that is produced by all living people. In this case, the stem cell is limited as to what it can become and in the case of regenerative medicine it can become connective tissue such as ligament, tendon or cartilage. It cannot become your twin, kidney or lung. There are however other stem cells that can become these things but cannot be used in regenerative medicine and are no longer produced after birth. These are not the cells I will be referring to. 2. Adult mesenchymal stem cells have been sold to cure just about any ailment. The truth is that every living person is currently producing their own stem cells. 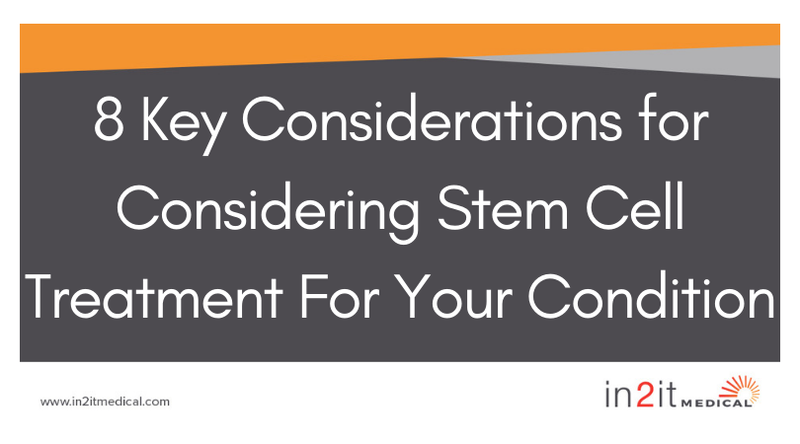 Currently there are 3 ways to obtain adult mesenchymal stem cells. a. The first of which is from a bone marrow aspiration. This technique is an in-office procedure which requires the introduction of a trocar or large needle into the ileum or hip bone, not the femur. Upon introduction of the trocar into the bone marrow the physician can aspirate bone marrow which can then be processed and separated into components. In the case of stem cells, we are attempting to concentrate and obtain as many as possible. Bone marrow aspiration, although it sounds terrible, is an in-office procedure which is very tolerable and done with the use of local anesthetic. b. The second way to get stem cells is from adipose tissue or fat. Fat is very rich in adult mesenchymal stem cells. However, according to current FDA guidelines, it is not recommended that the fat be processed to obtain stem cells. However, the fat can be used without processing and is very helpful in several painful processes but currently we cannot obtain or isolate stem cells from fat based on current FDA guidelines. c. The third way to obtain stem cells is from amniotic tissue. This is obtained from donors that have offered to donate afterbirth for research and scientific purposes. Upon processing of amniotic tissue, stem cells and other components can be obtained. The cells are often advertised as younger and more potent with a larger yield. It is true that they are younger; however, the yield is miniscule compared to that of bone marrow aspiration or fat concentrations. The practitioners generally advertising these type of cells as the best type for regenerative injections are those that do not have training in diagnostic or interventional imaging or have not received training necessary to obtain other types of stem cells. Amniotic cells can be purchased from the supplier for anywhere from $700-$2000 for 0.5-1cc (not much volume). These come in frozen aliquots and when brought to room temperature can be injected. Secondary to processing and the required freeze thaw preparation, most of the live cells end up being destroyed during the process and very few live cells are left. When compared to bone marrow derived stem cells, the live cell counts are much higher in the bone marrow group. As stated above, practitioners that tout the advantages of amniotic derived cells generally lack training and the inability to hit targets. It's very imperative that the consumer determine the skill of the practitioner prior to participating in any of these treatments. 3. A medical degree or graduation from a medical program does not automatically make a person expert in musculoskeletal medicine. For instance, when a nurse practitioner, chiropractor or doctor graduate from their respective schools, there is no specialization that occurs (that is what residency or fellowships are for). They would be considered general practitioners. In the case of medical and osteopathic doctors, there is always a 3-7 year residency following medical school which leads to specialization. In the field of regenerative medicine, there is currently no board certification such as there is with family practice, surgery or pediatrics. There is, however, a certification offered by the American Academy of Orthopedic Medicine (AAOM). There are also a few non-credentialed fellowship opportunities run by private independent practitioners. The closest thing to specialization in regenerative medicine would be through a sports medicine fellowship where the fellow can get experience in regenerative injection therapies and guided injections. 4. Guidance is a must when performing regenerative injections. For instance, if the patient’s problem is the medial collateral ligament of the knee, it does no good to inject a regenerative solution somewhere near the ligament as it will never end up in the ligament accidentally. It is imperative when treating the medial collateral ligament to actually hit the ligament, and in order to hit the ligament, the practitioner would have to see it first, recognize it and then guide a needle to it. Currently, ultrasound is the most utilized modality in the regenerative field. Ultrasound is great secondary to its ability to see connective tissue. Fluoroscopy which is an x-ray guided procedure is great for joints; however, it is not optimal for soft tissue injections. There is currently a credentialing body for diagnostic and ultrasound-guided procedures. The credentialing body is called the American Registry for Diagnostic Muscluloskeletal Sonography or the ARDMS. The certification they provide is the RDMS or registered in diagnostic musculoskeletal sonography. If you're considering a regenerative injection, make sure the practitioner providing the injection is credentialed and certified by the ARDMS, which, at minimum, implies a baseline knowledge of diagnostic and therapeutic ultrasound interventions. 5. As stated previously, except for the American Academy of Orthopedic Medicine, there is no standardization for formal training or certification for regenerative medicine and its application. In most cases, practitioners will attend a weekend conference to learn the principles of regenerative injections and the marketing skills necessary to make it lucrative. I have had the opportunity to teach regenerative medicine techniques, applications and diagnostic/interventional ultrasound with several professional organizations including the AAOM, the Hackett-Hemwall- Patterson Foundation at the University of Wisconsin and Gulf Coast Ultrasound which has led to the introduction of several practitioners in several fields. Without fail, at every course I teach, the most commonly asked question is, “How much do you charge to do these procedures?” This question always annoys me as there are several practitioners looking for a new lucrative hobby. It appears that what has taken me years to learn is now being taught at a weekend course and now I’m competing with anybody that wants to dabble in regenerative medicine. As with any specialty, there are always those looking for an easy way to make a quick buck. Because regenerative injections are currently cash-based, this seems to be an opportunistic place to start for those practitioners wanting to make a great deal of money for very little effort. I would encourage you as a consumer to look into the practitioner’s website for credentialing, experience, and ultrasound ability prior to committing to a procedure. If you are having difficulty finding the answers to these questions, this is a good indication that something is being hidden from you. If you run across the practitioner that has an answer to every question and the answer is regenerative injections, you’re probably in the wrong place. 6. Can chiropractors administer regenerative injections? No, according to the Utah rules for professional conduct concerning chiropractors it reads: R156-73-501. Unprofessional Conduct includes: administering injections through the skin. They May: Administer topically applied medicinal agents, including steroids, anesthetics, coolants, and analgesics for wound care and for musculoskeletal treatment, including their use by iontophoresis or phonophoresis. If you run across a chiropractor claiming to inject or be able to inject regenerative therapies, you may want to consider finding a doctor. 7. There are more flavors of regenerative injection than just stem cells. a. Prolotherapy has been around the longest and is the best studied. Prolotherapy is the injection of a concentrated dextrose solution to promote the wound repair process. It has level 1A evidence that it works for knee osteoarthritis and lateral epicondylitis. It also has good evidence to support its use on other structures including low back pain. b. PRP or platelet rich plasma is another form of regenerative injection. This type of therapy involves a blood draw followed by centrifugation of the blood to concentrate the platelets which promote healing of the affected areas. PRP appears to work very well for tendon problems, osteoarthritis and other soft tissue injuries when more conservative treatment options have failed. c. If your practitioner offers only one type of regenerative therapy, there’s a good chance it’s all they know. 8. What about prolozone? Well, there is not much evidence to support its’ use and nobody knows how it works. Generally, prolozone is injected in combination with vitamins, lidocaine and steroid. This cocktail approach makes it difficult to know which ingredient is doing what. This type of injection appears safe which allows for a quick learning curve and does not require guidance or precision. I recently took care of a patient who had cervical spine prolozone following a car accident and the nurse practitioner inadvertently deposited the prolozone cocktail into the vertebral artery which resulted in a stroke and the patient was in a coma for 3 days. It was very scary, but the patient recovered well. This is another incident that could have been avoided with the use of guidance even when injecting a seemingly inert substance.